Maxwell has an amazing garden this year! We have 16 different tomato plants and they are producing like crazy! So much so that we are starting to need to come up with some ideas on how to use them :) I love that! So today as we ate some yummy Brandi Wine tomatoes on a BLT, we also roasted up a bunch of tomatoes and made a YUMMY sauce! So if you have extra tomatoes or if you just want to try to make a yummy tomato sauce, try this recipe! I am also starting to prep some freezer meals for Flag Football season (Maxwell coaches) and for when Baby Girl gets here, so we doubled this recipe. 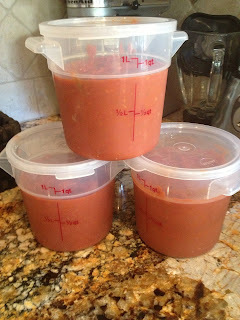 We plan to freeze all of this sauce, after we eat it for dinner tonight. It's sure to be tasty! Preheat over to 375 degrees. Cut tomatoes and push all the seeds out. This reduces the amount of liquid and makes sure your sauce isn't seedy. Spread on a foil lined cookie sheet. Drizzle with olive oil, salt and pepper and the garlic. Roast in the oven for 1 hour. Once pureed to your liking (I left mine chunky), add the remaining ingredients. Simmer on low for at least 2 hours to let all the flavors meld together. I let mine go for about 3 1/2. Use immediately or let cool and package it up to freeze. It should last in your freezer for 4-6 months. 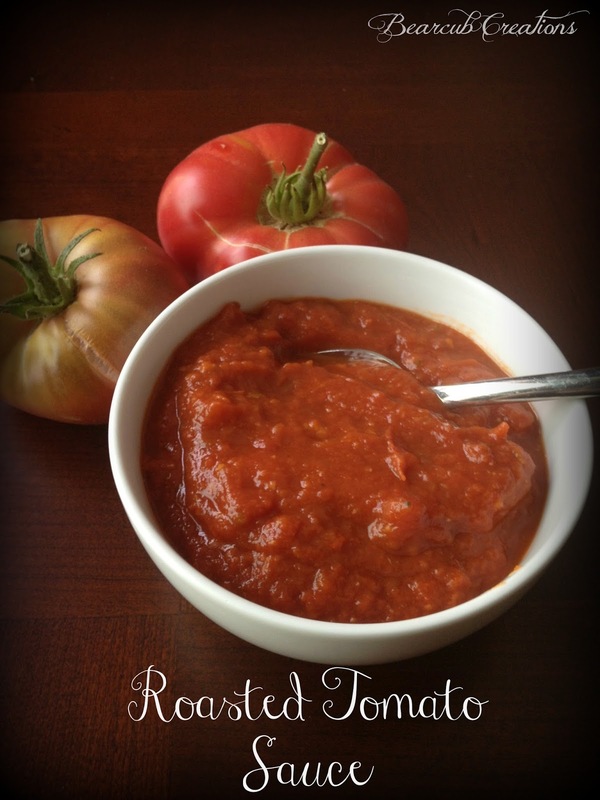 This is a great sauce to use on pasta, pizza, meatball sandwiches or anything else you want to use tomato sauce for. It is delicious! Enjoy!